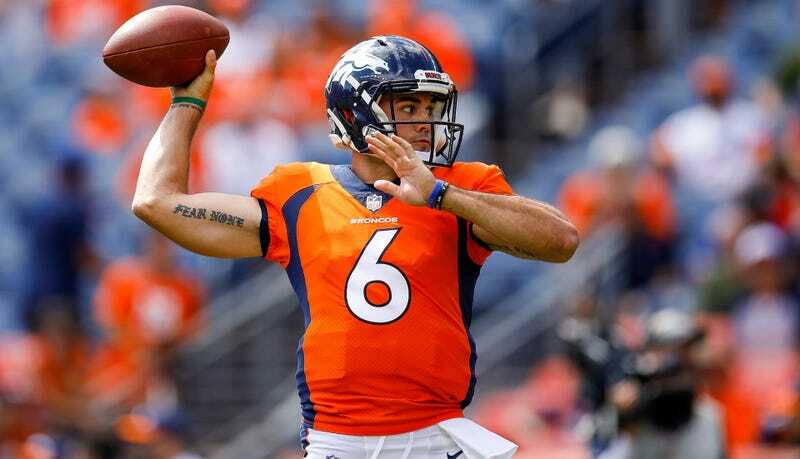 Broncos QB Chad Kelly Arrested After Allegedly Trespassing In Stranger's Home, "Mumbling Incoherently"
Broncos backup quarterback Chad Kelly was booked into the Arapahoe County Jail this morning on charges of first-degree criminal trespassing. Ian Rapoport of NFL Network first reported the arrest. According to the probable cause affidavit, which you can find an excerpt of below, Englewood PD responded to a trespassing call at 1:16 a.m. local time. The caller said that “an unknown male entered the residence uninvited and sat down on the couch next to her mumbling incoherently.” That male was later identified as Kelly, and he left the house after one of the residents hit him with an aluminum vacuum tube. He was arrested shortly after, one block away, in front of the Gothic Theater. The Broncos released a short statement acknowledging the arrest. Apparently, this all took place adjacent to Von Miller’s Halloween party. Kelly was reportedly released after a court appearance this morning, where he was represented by a public defender. An Englewood PD spokesperson said that they wouldn’t release the police report, since the case is still active. We will update this post if any more information becomes available.